We supply clothing labels to many of the UK and Europe largest brand name companies. 100% custom design and fast delivery. We have a wide range of materials and fabric label quality. Our design team will guide you through step by step to achieve the perfect end-result for your woven clothing label. A strong branding woven label is one of the most important aspects of any textiles business. 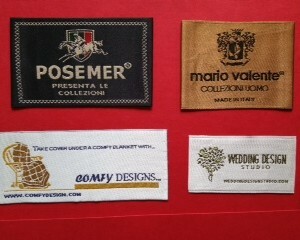 Below is a small collection of custom woven clothing labels that we made for our clients. A best quality woven fabric label gives your brand products a major edge in increasingly competitive markets. All of our labels are customized so that they can be unique for the clothing brand and really stand out for brand identity. 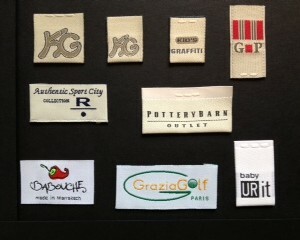 These woven fabric labels are very popular with high-end boutique collections who want a stand-out finish. And it is very easy to work with our team; we will take you through the process step by step to create a perfect woven clothing brand label. How to choose your custom-made woven garment labels quality? Feature: high density weaving, high-end quality, best woven image result; damask woven labels can acheive the most detailed weaving in logo design and texts weaving; a great durability woven clothes label. Feature: satin woven labels are high density weaving as well; just slightly less density weaving than damask label; they are high-end quality, elegant styles designer clothing labels; woven satin label is a great durability woven garment label. Feature: less density weaving, thinner fabric body; it is a good weaving quality, can achieve a good woven image result; great durability. 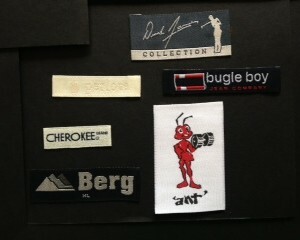 Taffeta woven labels are the cheapest woven garment labels. 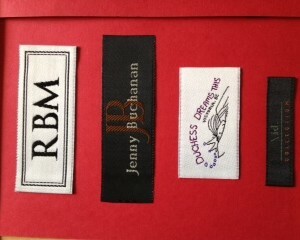 How do you like your woven fabric labels to finish and fold ? Two End Fold: we add additional 7 mm on two ends of the label to be folded. 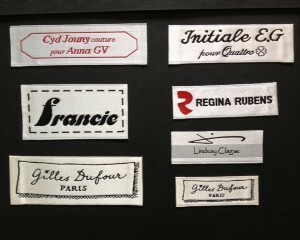 Each end fold labels are often sewn on each side ( left /right ends) onto the garment. Centre (Loop) Fold: The sewing space on the loop fold labels is on the top / bottom of the label. The avarage sewing space is ranging from 3 to 7mm on top/bottom ends. Loop fold labels are often sewn into the top seam of the clothes. Straight Heat Cut ( Single Cut Border Label) : This straight heat cut, flat labels are often sewn around all four sides (edges) of the label. 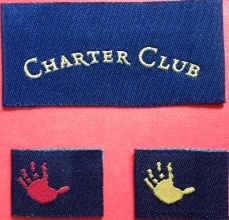 The flat labels can be also just sewn on one side, or two sides. We are one of leading UK Labelling company with over twenty years experience in supplying custom woven labels. 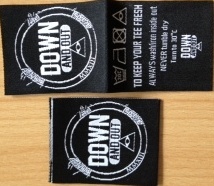 We produce the highest quality custom woven clothes labels at great prices, low minimum quantities and free UK delivery. 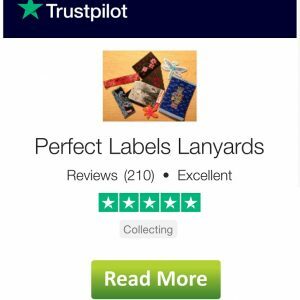 Read below customer testimonials and find out why Pefect_Labels_Lanyards is one of the leading UK clothes labels suppliers who can promise you the good quality woven labels . It is simple & easy to custom a brand label. Contact us and send your artwork to us today, we will help to design and manufacture an outstanding brand clothing label for your textiles products and help set your business or clothing company apart from your competitors. We offer a huge variety of fabric labels qualities ranging from needleloom woven edge, broadloom heat-cut edge, and ultra-sonic cut broadloom labels. Woven fabric label is a textile formed by weaving. Woven fabrics labels are created on a loom, and made of different coloured threads woven on a warp and a weft. The base fabric, logo, and texts are all textile formed by weaving. Technically, a woven fabric label is a fabric made by interlacing two or more threads at right angles to one another. And it is an international acceptance standard for a weave tolerance at 1.5mm. The weaving technique does have a certain limit to duplicate the exact artwork image. However, 99% of our customers are happy with the end-result of our weaving technique to create a good quality woven image. If you like an exact 100% duplicate artwork image, then you need to consider a printed version, which can easily achieve an exact duplicate artwork image by oil print. This damask weave fabric label is a very durable and high-density woven matte finish clothing label. It is soft and smooth texture. It has the best and define weaving image. This labels are the most popular high street clothing brand labels; they are suitable for high-end expensive clothing brands. Let us help you to build and sustain a great brand image. This innovative hybrid labels are with 3D logo silicone transfer onto woven labels , it creates a beautiful 3D effect. The method used for silicone heat transfer is also kind to the environment. Rubber labels can be customised in just about any way possible. So, if your brand logo is something unique, you can make this really stand out on clothing labels, with a customised 3D logo transfer onto a woven fabric label. Garment manufacturers will appreciate the importance of high quality branding within any fashion clothing that’s produced. Unique clothing offerings from top designers are often classed as signature pieces of work, needing little by way of labelling or branding. But, in the competitive fashion clothing industry, it’s often the case that the clothing labels inside garments are the way consumers recognise their favourite brands. 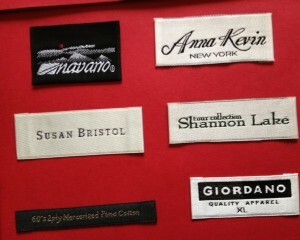 Perfect Labels-Lanyards provides the top quality woven labels, hang tags and fabric labels needed for fashion branding. We are specialists in the production of narrow fabric labels and our knowledgeable consulting team offer all potential clients a comprehensive consultation and advice service to ensure all labels provided are a perfect match to client brands and culture. We produce a vast array of bespoke woven labels including 100% polyester, and 100% cotton woven labels. All high-quality finish products enabling you to promote your brand in stylish, and cost-effective ways on many different products. Our minimum order for woven polyester labels is 1 – 500 woven fabric labels.